Amazing furniture can reach you wherever you are in the world from Spacify. By the beginning of the second millennia, Spacify has been founded with the aim to provide modern designed furniture within everyone’s budget. You can buy the best modern bedroom sets in affordable prices from Spacify as they sell their quality furniture over the internet directly from the factory to you, eliminating the cost of middlemen. When you buy a modern bedroom set from Spacify, you will get the benefit of free shipping with no tax on your furniture. Spacify bedroom sets are distinguished by incorporating the latest trends of decoration from the best brand names from Italy, Spain, Denmark, Sweden, USA, Canada, and many other parts of the world. Otello Modern Platform Bed Suite by Huppe is a perfect modern bedroom set with its completeness, uniqueness and color. The charcoal colored set shown in the picture can fit stylishly in a room painted in contrasting white to show the dimensions of every piece elegantly. Decorating around with red like using red bed sheets also accentuates the beauty of the black and white combination. 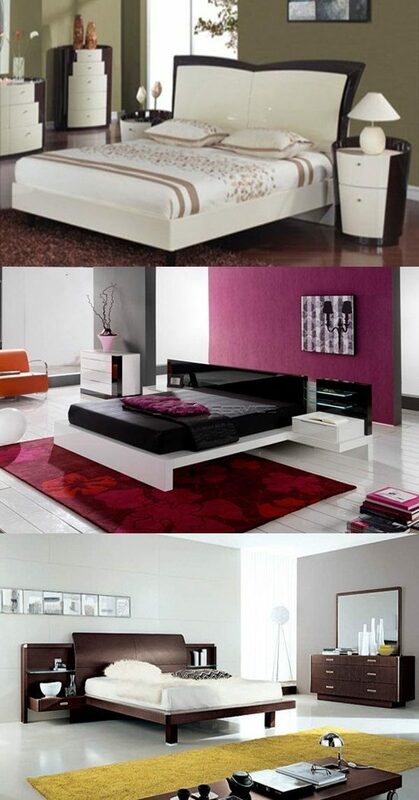 If you prefer modern style with a hint of luxury then this Enter 5 piece Bedroom Set by Doimo shall satisfy you. The side lights placed in the captivating headboard provide graceful lighting without taking up space. This option leaves you the freedom to decorate your nightstands with accessories that will bring out your personality. The neutral colors expressed in this bedroom set make it extremely comfortable for sleeping calmly. Having a look at this Tower Designer Bedroom Suite by Huppe will shatter any doubting ideas about the beauty of modern bedroom sets. This bedroom set has a unique design seen all over the set from the bed to the nightstands. This harmony in design will save you the time and of trying to match different bedroom items and focus on expressing your individuality using accessories only.